John Templon of Big Apple Buckets is the RTC correspondent for America East. You can find him on Twitter at @nybuckets. Getting Healthy: A number of America East teams are counting on the healthy return of star players to help boost their fortunes this season. New Hampshire has two players returning from injuries that cost them time last season, Alvin Abreu and Ferg Myrick. Abreu was a second-team all-league choice in 2009-10 before missing all but two games of last season with a knee injury. Myrick averaged 12.1 PPG and 4.1 RPG last season, but missed 16 games due to his own knee injury. 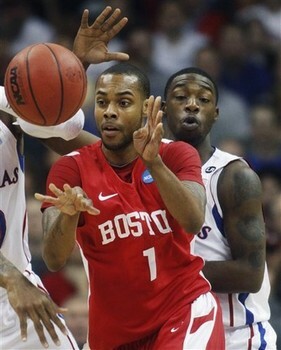 Another second-team player from 2009-10, Tommy Brenton, returns for Stony Brook as well. Even after missing last season, Brenton is the current conference leader in career rebounds. One player who missed most of last season, Boston University’s Jake O’Brien, unfortunately re-injured his ankle and will miss the entire 2011-12 campaign as well. Departed Head Men: Two of the top teams in the America East lost their head coaches during the offseason carousel. Pat Chambers made the NCAA Tournament at Boston University and then left for Penn State and Mike Lonergan went from Vermont to the head job at George Washington. Former Columbia head coach Joe Jones is replacing Chambers, while the Catamounts decided to promote John Becker. Becker was Lonergan’s assistant for the past five seasons. Learning The Hard Way: Boston University is one of the league favorites and the Terriers will find out quickly if they’re for real. The non-conference schedule is a very difficult one that includes road games at Texas, Boston College and Villanova. Another way to learn about the conference early in the season is to watch Boston College. The Eagles also play against New Hampshire, a team which could surprise people, and Stony Brook during non-conference play. The Great Race and Parity: This season’s conference race looks like it’s going to be a three-horse race with Boston University, Vermont and Stony Brook ahead of the pack. That might be good news for the Seawolves as five different teams have won the conference title in the past five seasons. Since the Catamounts won in 2010 and the Terriers in 2011, maybe 2011-12 is the season where Stony Brook breaks through for its first ever NCAA Tournament appearance. With the completion of the NBA Draft and the annual coaching and transfer carousels nearing their ends, RTC is rolling out a new series, RTC Summer Updates, to give you a crash course on each Division I conference during the summer months. Our newest update comes courtesy of our America East correspondent, John Templon. John also writes about New York City basketball at Big Apple Buckets. 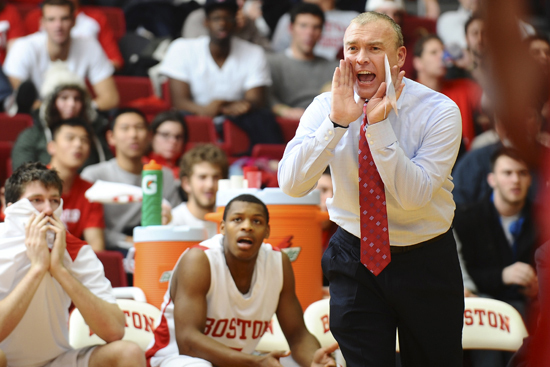 Coaches Moving On Up: Vermont and Boston University lost two very talented coaches this summer. The Catamounts’ Mike Lonergan went back to his Washington, D.C., roots and took the job at George Washington. Lonergan – who won a national title at Division III Catholic University in D.C. and also coached at Maryland – should fit in well at GW. Assistant John Becker replaced Lonergan, so there should be strong continuity. On the other hand, BU had to scramble after Pat Chambers was hired by Penn State to replace Ed DeChellis. The Terriers ended up with former Columbia head coach Joe Jones, who spent last season as an assistant at Boston College. Playing With The (Future) Pros: The 2010-11 America East Player of the Year, Boston University’s John Holland, played in the Portsmouth Invitational. He finished tied for ninth in scoring at 15.0 points per game and 18th in rebounding with 6.3 boards per game. He played with former Florida forward Vernon Macklin and former Villanova guard Corey Fisher on the Portsmouth Sports Club team that finished in fourth place. Holland had workouts with a few NBA teams before signing with Chorale de Roanne of France’s Pro A Division. A World of Experience: America East continues to pick up steam as a worldwide conference. Four players in Maine’s incoming recruiting class aren’t originally from the United States and Albany has two players coming in from Australia and another from the Dominican Republic in its 2011 class. Another Australian, Corban Wroe, will be playing for Hartford in the fall. Many of the incoming recruits have experience playing with their respective international squads and incoming Maine freshman Noam Laish was selected as the captain of Israel’s U-18 squad for the European Championships. Patrick Chambers parlayed last season's tournament berth with BU into a payday at Penn State, sending BU scrambling (credit: Steve McLaughlin).